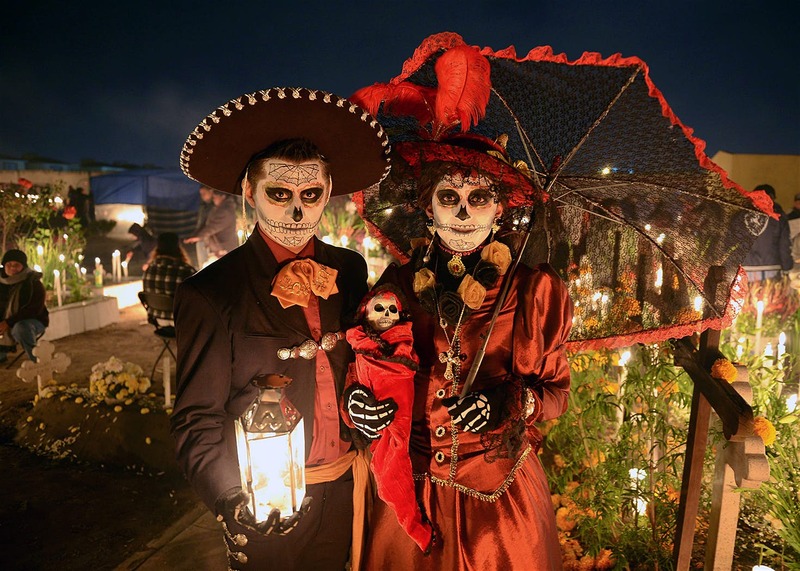 Today is the Day of the Dead (Día de Muertos), celebrated throughout Mexico, in particular the Central and South regions, and by people of Mexican heritage elsewhere. 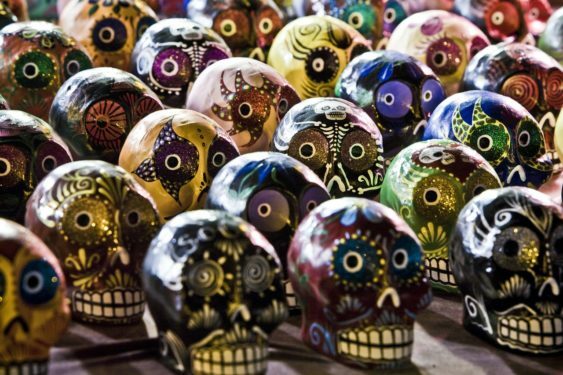 The holiday is sometimes called Día de los Muertos in Anglophone countries, a back-translation of its original name, Día de Muertos. It is particularly celebrated in Mexico where the day is a public holiday. Prior to Spanish colonization in the 16th century, the celebration took place at the beginning of summer. Gradually, it was associated with October 31, November 1, and November 2 to coincide with the Western Christian triduum of Allhallowtide: All Saints’ Eve, All Saints’ Day, and All Souls’ Day. Traditions connected with the holiday include building private altars called ofrendas, honoring the deceased using calaveras, aztec marigolds, and the favorite foods and beverages of the departed, and visiting graves with these as gifts. Visitors also leave possessions of the deceased at the graves. At this point I could begin my usual rant of ridiculing the notion that indigenous people of Mexico have been observing a Day of the Dead for thousands of years, as I do with a host of folk customs; but I’ll keep it simple. We don’t know what indigenous peoples in Mexico did before Spanish colonization because most of those cultures did not have writing systems. We have only oral tradition and archeology to rely on, and they do not tell us much. At one time there was a festival in late August dedicated to the goddess Mictecacihuatl, (literally “Lady of the Dead”), Queen of Mictlān, the underworld, ruling over the afterlife with Mictlāntēcutli, her husband. Her role is to watch over the bones of the dead and preside over the ancient festivals of the dead. She now presides over the contemporary festival as well. She is known as the “Lady of the Dead”, since it is believed that she was born, then sacrificed as an infant. Mictēcacihuātl was represented with a flayed body and with jaw agape to swallow the stars during the day. 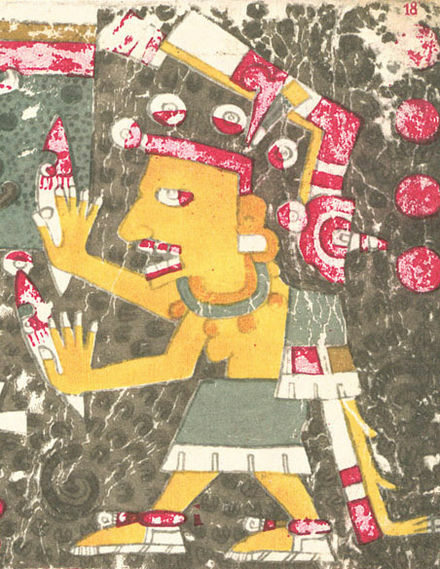 The original Aztec celebrations dedicated to Mictēcacihuātl lasted an entire month, but under the influence of the Catholic church, the old celebrations were suppressed, and collapsed into the period of Hallowtide. Yet, some of the older practices remain. People go to cemeteries to be with the souls of the departed and build private altars containing the favorite foods and beverages, as well as photos and memorabilia, of the departed. The intent is to encourage visits by the souls, so the souls will hear the prayers and the comments of the living directed to them. Celebrations can take a humorous tone, as celebrants remember funny events and anecdotes about the departed. Plans for the day are made throughout the year, including gathering the goods to be offered to the dead. 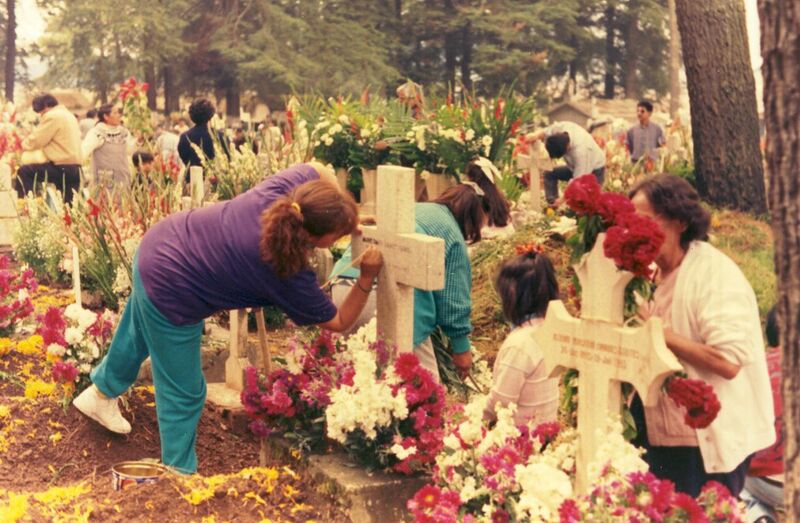 During the three-day period families usually clean and decorate graves; most visit the cemeteries where their loved ones are buried and decorate their graves with ofrendas (altars), which often include orange Mexican marigolds (Tagetes erecta) called cempasúchil (originally named cempoaxochitl, Nāhuatl for “twenty flowers”). 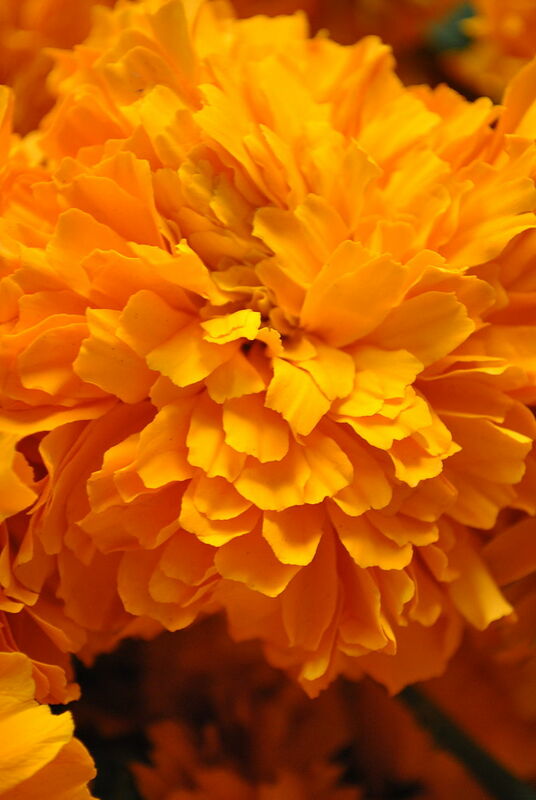 In modern Mexico the marigold is sometimes called Flor de Muerto (Flower of the Dead). These flowers are thought to attract souls of the dead to the offerings. It is also believed the bright petals with a strong scent can guide the souls from cemeteries to their family homes. Toys are brought for dead children (los angelitos, or “the little angels”), and bottles of tequila, mezcal or pulque or jars of atole for adults. Families will also offer trinkets or the deceased’s favorite candies on the grave. 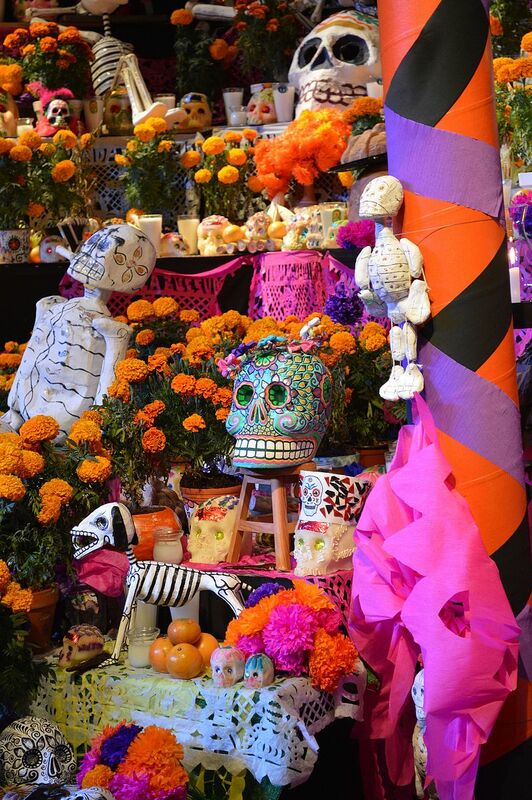 Some families have ofrendas in homes, usually with foods such as candied pumpkin, pan de muerto (“bread of the dead”), and sugar skulls; and beverages such as atole. The ofrendas are left out in the homes as a welcoming gesture for the deceased. 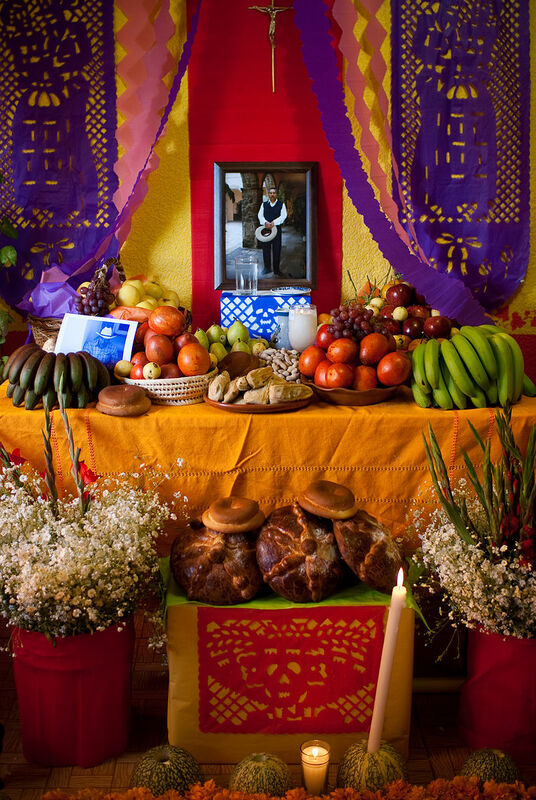 Some people believe the spirits of the dead eat the “spiritual essence” of the ofrendas food, so though the celebrators eat the food after the festivities, they believe it lacks nutritional value. Pillows and blankets are left out so the deceased can rest after their long journey. In some parts of Mexico, such as the towns of Mixquic, Pátzcuaro and Janitzio, people spend all night beside the graves of their relatives. In many places, people have picnics at the grave site, as well. Some families build altars or small shrines in their homes; these sometimes feature a Christian cross, statues or pictures of the Virgin Mary, pictures of deceased relatives and other people, scores of candles, and an ofrenda. Traditionally, families spend some time around the altar, praying and telling anecdotes about the deceased. In some locations, celebrants wear shells on their clothing, so when they dance, the noise will wake up the dead; some will also dress up as the deceased. Public schools at all levels build altars with ofrendas, usually omitting the religious symbols. Government offices usually have at least a small altar, as this holiday is seen as important to Mexican heritage. People sometimes create short poems, called calaveras (skulls), mocking epitaphs of friends, describing interesting habits and attitudes or funny anecdotes. This custom originated in the 18th or 19th century after a newspaper published a poem narrating a dream of a cemetery in the future, “and all of us were dead”, proceeding to read the tombstones. Newspapers dedicate calaveras to public figures, with cartoons of skeletons in the style of the famous calaveras of José Guadalupe Posada, a Mexican illustrator. Theatrical presentations of Don Juan Tenorio by José Zorrilla (1817–1893) are also traditional on this day. A common symbol of the holiday is the skull (calavera), which celebrants represent in masks, called calacas (colloquial term for skeleton), and foods such as sugar or chocolate skulls, which are inscribed with the name of the recipient on the forehead. Sugar skulls can be given as gifts to both the living and the dead. 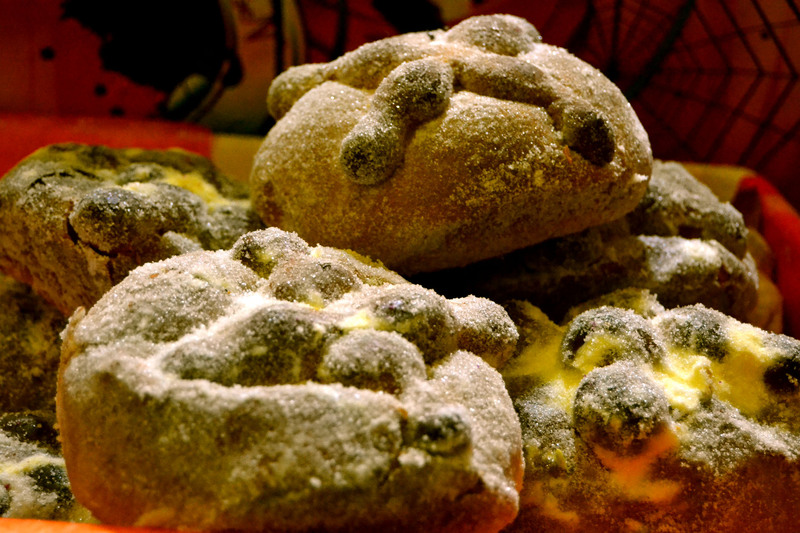 Other holiday foods include pan de muerto, a sweet egg bread made in various shapes from plain rounds to skulls and rabbits, often decorated with white frosting to look like twisted bones. It is a sweetened soft bread shaped like a bun, often decorated with bone-shaped phalanges pieces. In some regions, it is eaten for months before the official celebration of Día de Muertos. 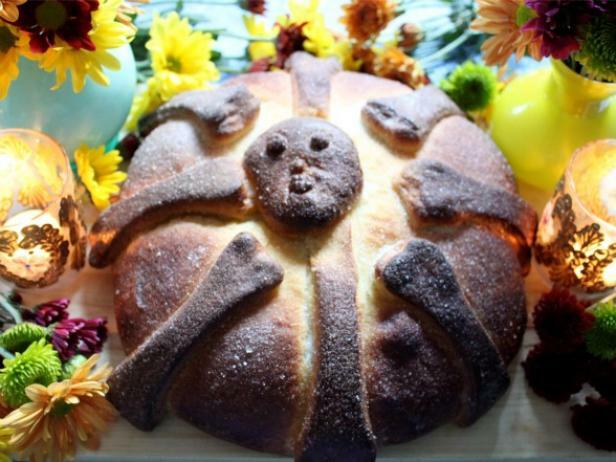 In Oaxaca, pan de muerto is the same bread that is usually baked, with the addition of decorations. As part of the celebration, loved ones eat pan de muerto as well as the relative’s favorite foods. The bones represent the deceased one (difuntos or difuntas) and there is normally a baked tear drop on the bread to represent goddess Chimalma’s tears for the living. The bones are represented in a circle to portray the circle of life. The bread is topped with sugar. The classic recipe for pan de muerto is a simple sweet bread recipe, often with the addition of anise seeds, and other times flavored with orange flower water or orange zest. Here is a good instructional video, but you will need to understand some Spanish.